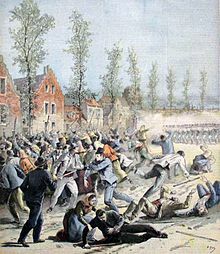 Direct action originated as a political activist term for economical and political acts in which the actors use their (e. g. economic or physical) power to directly reach certain goals of interest, in contrast to those actions that appeal to others (e. g. authorities) by, for instance, revealing an existing problem, highlighting an alternative, or demonstrating a possible solution. Both direct action and actions appealing to others can include nonviolent and violent activities which target persons, groups, or property deemed offensive to the action participants. Examples of nonviolent direct action (also known as nonviolence, nonviolent resistance, or civil resistance) can include (obstructing) sit-ins, strikes, workplace occupations, street blockades or hacktivism, while violent direct action may include political violence or assaults. Tactics such as sabotage and property destruction are sometimes considered violent. By contrast, electoral politics, diplomacy, negotiation, protests and arbitration are not usually described as direct action, as they are politically mediated. Non-violent actions are sometimes a form of civil disobedience, and may involve a degree of intentional law-breaking where persons place themselves in arrestable situations in order to make a political statement but other actions (such as strikes) may not violate criminal law. Direct action tactics have been around for as long as conflicts have existed but it is not known when the term first appeared. The radical union the Industrial Workers of the World first mentioned the term "direct action" in a publication in reference to a Chicago strike conducted in 1910. Other noted historical practitioners of direct action include the American Civil Rights Movement, the Global Justice Movement, the Suffragettes, LGBT and other human rights movements (I.e, ACT UP); revolutionary Che Guevara, and certain environmental advocacy groups. Martin Luther King felt that non-violent direct action's goal was to "create such a crisis and foster such a tension" as to demand a response. The rhetoric of Martin Luther King, James Bevel, and Mohandas Gandhi promoted non-violent revolutionary direct action as a means to social change. Gandhi and Bevel had been strongly influenced by Leo Tolstoy's The Kingdom of God Is Within You, which is considered a classic text that ideologically promotes passive resistance. By the middle of the 20th century, the sphere of direct action had undoubtedly expanded, though the meaning of the term had perhaps contracted. Many campaigns for social change—such as those seeking suffrage, improved working conditions, civil rights, abortion rights or an end to abortion, an end to gentrification, and environmental protection—claim to employ at least some types of violent or nonviolent direct action. In the 1980s, a California direct action protest group called Livermore Action Group called its newspaper Direct Action. The paper ran for 25 issues, and covered hundreds of nonviolent actions around the world. The book Direct Action: An Historical Novel took its name from this paper, and records dozens of actions in the San Francisco Bay Area. 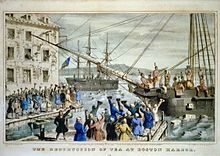 "The Destruction of Tea at Boston Harbor"
6. ... believes that the universe is on the side of justice. Applied strategically to his campaign for civil rights, Dr. King wrote in his Letter from Birmingham Jail that "Nonviolent direct action seeks to create such a crisis and foster such a tension that a community which has constantly refused to negotiate is forced to confront the issue. It seeks to so dramatize the issue that it can no longer be ignored." One major debate is whether destruction of property should be included within the realm of violence or nonviolence. This debate can be illustrated by the response to groups like the Earth Liberation Front and Animal Liberation Front, which use property destruction and sabotage as direct action tactics. Although these types of actions are often prosecuted as violence, those groups justify their actions by claiming that violence is harm directed towards living things and not property. The issue of whether sabotage is a form of violence is difficult to resolve in purely philosophical terms, but the use of sabotage as a method can be contrasted with minor property damage that is a small but necessary part of a non-violent campaign method such as breaking locks and fences to gain entry to a site. Some theorists and activists believe that a doctrine of diversity of tactics can resolve the controversy. ^ The I.W.W. : Its First Seventy Years, 1905-1975, Fred W. Thompson and Patrick Murfin, 1976, page 46. ^ a b de Cleyre, Voltairine (1912). Direct Action – via Wikisource. ^ a b King, Martin Luther, Jr. (16 April 1963). "Letter from Birmingham Jail". ^ "First Day on the Job!". Grist.org. Retrieved 2013-08-09. ^ "Greenpeace Scales Mt Rushmore – issues challenge to Obama". Grist.org. Retrieved 2013-08-09. ^ Alyona Minkovsky, Kevin Zeese (24 May 2011). More activists arrested under Obama. RT.com (The Alyona Show). ^ Percy, John (June 2008). "Direct Action – two earlier versions". Revolutionary Socialist Party. Retrieved 15 June 2009. ^ "The King Philosophy". thekingcenter.org. The King Center. ^ Dieter Rucht. Violence and New Social Movements. In: International Handbook of Violence Research, Volume I. Dordrecht: Kluwer, 2003, p. 369-382. ^ "Hallmarks of People’s Global Action (amended at the 3rd PGA conference at Cochamamba, 2001)". ^ Rowe, James K.; Carroll, Myles (2014-04-03). "Reform or Radicalism: Left Social Movements from the Battle of Seattle to Occupy Wall Street". New Political Science. 36 (2): 149–171. doi:10.1080/07393148.2014.894683. ISSN 0739-3148. ^ Orakhelashvili, Alexander. The Interpretation of Acts and Rules in Public International Law. Oxford: Oxford University Press, 2008. ^ Taylor, Matthew (26 January 2010). "Ministry of Justice lists eco-activists alongside terrorists". The Guardian. London. Retrieved 1 May 2010. ^ "FREQUENTLY ASKED QUESTIONS". Food Not Bombs. Retrieved 7 August 2012. This page was last edited on 19 April 2019, at 10:35 (UTC).